As the Cultural Revolution approached, parallel institutions were emerging within Lin Biao’s military as its spread Mao Zedong Thought to the broader society. These new institutions would play a big role in the battle against the Party bureaucracy, which had become dominated by revisionists. Similarly, although all sides sought to appropriate Mao’s words and image, two kinds of authority came into conflict. On the one side, there was the revisionist Party bureaucracy. The authority of the Party was used as a way to convince the masses to defer to the bureaucracy, the local cadres, upward through the chain of command, even when obedience did not serve the interests of the masses. Deference upward, through bureaucratic layers, was very old in Chinese culture. Such obedience was a hallmark of Confucianism. On the other hand, a cult around the personalities of Mao, and to a lesser extent, Defense Minister Lin Biao were promoted in the military and its parallel institutions. The Mao cult had existed for some time, even since the time of the people’s war. However, now, the cult began to grow massively and take root in across all parts of society. Through the Cultural Revolution, the cult became a way to trump Party authority. The Party no longer could claim to be the only interpreter of Mao. The Party no longer had a monopoly on authority and legitimacy. The cult, along with the dissemination of Mao’s works, especially “the little red book,” gave individuals themselves the ability and courage to question, and, ultimately, rebel against the Party. The cult, with all the problems that arise from it, was a kind of “Protestant” rebellion that democratized revolutionary authority. The cult was a battering ram that any individual could wield against the bureaucracy at any level. Mao went on to criticize education. In preparation for future struggle with revisionists, capitalist roaders, he told leftists that they must go beyond their own circles and make contact with the masses. They must take care to explain the works of revolutionary science to the masses as preparation for the offensive to come. (1) As Mao made made declarations from outside the capital, Lin Biao’s military continued to promote Mao Zedong Thought and the politicization of society as a way to push against the revisionist layers of the Party in the months to come. On January 24, 1966, the army published a speech by general Xiao Hua, General Political Department of the People’s Liberation Army: “Hold High the Great Banner of The Thought of Mao Zedong, And Resolutely Implement The Five Point Principle Of Bringing Politics To the Fore.” (2) Also “Let Us Be Armed With The Thought Of Mao Zedong And Become Proletarian, Revolutionary Fighters In Literature And Art” (3) The official Cultural Revolution was about to begin. Soon this would all change. The Cultural Revolution was about to escalate. When does the Cultural Revolution Begin? There is some confusion about the dates — the beginning, end, and duration — of the Cultural Revolution. Some loosely refer to the last decade of Mao’s life from 1965 or 1966 to 1976 to be the “Cultural Revolution decade.” The Chinese revisionists in their official Party history continue to count the entire last decade of Mao’s life as the “Cultural Revolution.” In reality, there had been Maoist efforts since the Great Leap that continued until the fall of the Gang of Four on October 6, 1976. However, when most people think of the Cultural Revolution, they think of the incredible mass movements that, for the most part, took place between 1966 and into 1968, when Mao helped to end them. Another case could be made that the Cultural Revolution was about remaining on the socialist road, moving toward communism. With this in mind, it is important to note that forward, revolutionary momentum was ending before the fall of Lin Biao in 1971. Chen Boda, a key Maoist theorist, was purged in 1970 as Mao shifted rightward. A final blow is landed with the fall of Lin Biao and the loss of the army, “pillar of the dictatorship,” with all its might, to the revisionists. Thus the march forward to communism ends, the “Cultural Revolution” ends, with the final defeat of Lin Biao on September, 13, 1971. After that, it is all decline with no hope of rejuvenation. But again, officially, by 1970, it was already over. The Chinese held the view that the Cultural Revolution was not ongoing after April 1, 1969, that the radical period had ended with the conservative turn as Mao began shifting rightward. It was only later, in 1974, that Mao surprised everyone by announcing “The Great Proletarian Cultural Revolution is already in its eighth year.” (5) Thus Party history was rewritten, revising the previous assessment that the Cultural Revolution’s end was marked by the Ninth Congress of the Chinese Communist Party in April 1, 1969. In any case, most histories mark Yao Wenyaun’s polemic against Wu Han as the beginning of the Cultural Revolution even though there were numerous similar polemics and debates that had been going on for years. In a way, our concept of the Cultural Revolution as having a definite beginning and end is somewhat contrived, based on later myth making. Maoist efforts had been going on since the aftermath of the Great Leap and they continued to go on even after the Ninth Congress in April of 1969, continued to go on after Lin Biao’s death in 1971, and even continued to go on through the 1970s. Exact dates are not all that important. Every Marxist is aware of the idealist nature of “the great man theory of history.” Yet it is difficult to write political history without reference to leaders. Fall of individuals at the top represent changes in underlying social forces whose reversal cannot be pinpointed to an exact date. The rise and fall of individual leaders represents shifts within society. It is not that any individual leader alone determines whether socialism continues or not, but rather that the fates of individual leaders are determined by complex underlying processes. It is not that the death of Lin Biao, the death of Mao, or the fall of Chen Boda and his allies or the Gang of Four cause the reversal of socialism, but rather that the shifting fortunes of socialism become reflected at the top. Contrary to the “great man theory” that Marx criticized, in the final analysis, individuals alone do not make history, “all history is the history of class struggle.” Thus this is a history of the rise of New Power against Old Power, a history of institutional conflict. It is also a history of the struggle between contending ideologies and culture. Even so, the story really can’t be fully told without reference to the political struggles between leaders, which reflects the struggles between middle cadres, which reflects the struggle between lower cadres, which reflects struggles within the population itself. Thus this chapter begins with the fall of Wu Han, a revisionist leader in the cultural establishment. Wu Han was a prominent historian and Vice-mayor of Beijing under Mayor Peng Zhen. They were closely allied with other revisionists like Lu Dingyi, alternate member of the Politburo and member of the Central Secretariat and head of the Central Committee Propaganda Department. And, most of all, they were allied to President Liu Shaoqi and Vice-chairman Deng Xiaoping. Peng Zhen, Lu Dingyi, and Wu Han were leading figures in the cultural establishment. They set cultural policies. They acted as censors and patrons. At times, they personally penned political works lampooning the Maoists. Yao Wenyuan’s attack on Wu Han would be part of a chain reaction that would unleash an whirlwind that would shake the entire system, and eventually culminate with the fall of the entire clique, including top revisionist, capitalist President Liu Shaoqi. The confrontations began as small conflicts in the cultural and academic world, but they would grow bigger and bigger. Just as most conflicts between the Maoists and revisionists go back to the Great Leap, so to does the confrontation between Yao Wenyuan and Wu Han. The Maoists sought writers for the campaign against Wu Han’s work. Jiang Qing sought out Li Xifan, a literary critic in Beijing who worked at the People’s Daily. He declined to lead off the new campaign, perhaps fearing Wu Han’s powerful connections to top officials Peng Zhen and Deng Xiaoping. After approaching other writers in Beijing unsuccessfully, she relied on Ke Qingshi, Mayor of Shanghai at the time. He had supported Mao during the Great Leap. Before he died in 1965, Ke Qingshi introduced her to both Zhang Chunqiao and Yao Wenyuan. The latter was a literary critic who was relatively unknown, but had taken up the Maoist cause in academic debates in previous years. Jiang Qing would become their political patron. All three would play a big role in the coming years. (14) They would come to form a Shanghai clique, and eventually be denounced, along with Wang Hongwen, as part of the “Gang of Four” in the 1970s. To take on such powerful figures in the establishment could result in prison or even assassination. When Peng Zhen learned of the article, he sought to censor key passages. After failing, he sought to prevent the article’s publication entirely, even in Shanghai. According to later Red Guard publications, Peng Zhen left Beijing to visit Shanghai in this period. Thus he understood the danger to his power. The tables had recently turned in Shanghai because the Maoist mayor Ke Qingshi had recently died. He was replaced with revisionist allies of Peng Zhen and Wu Han. (16) (17) Aside from a few leading figures of the cultural and political establishment, at the time, Yao Wenyuan’s criticism was not seen as especially important within the broader population. This is partially because Yao Wenyuan’s criticism of Wu Han did not occur in a vacuum. It occurred amidst a vast debate in literature and art. One witness reports that “it was neither more nor less significant than any of a dozen other debates and campaigns the preceding year.” (18) Other similar articles by Qi Benyu, Guan Feng, and Lin Jie appeared criticizing the work. (19) Another recalls that “no one thought this particular controversy was very serious. It was only art and literature, after all.” (20) At the time, this uneventful event will become more important as the Cultural Revolution unfolds and the narrative is shaped. Later, Mao, looking back, would remark that the time had come for a “monkey king” to brandish his “golden cudgel against Peng Zhen’s imperial court.” (21) It was time to create disorder in heaven, to shake up the establishment. Peng Zhen was a Party bigwig. Peng Zhen had a long-standing and close relationship with Deng Xiaoping going back at least to the 1950s when they worked closely on the Secretariat together. Peng Zhen was appointed second in command to Deng Xiaoping at the First Plenum of the Eighth Party Congress. (22) They collaborate in their political work. They made inspection tours together. Their families were close to each other. Deng Xiaoping discharged important duties to Peng Zhen, especially in legal and security matters. Peng Zhen frequently appeared in public and made speeches. He was often the face of the regime abroad. Peng Zhen correctly recognized, long before others, that the struggle over Wu Han’s play was just the beginning of a much wider movement against the rightists and revisionists. Peng Zhen correctly saw a danger in the campaign. Instead of trying to oppose it directly, Peng Zhen reacted to the controversy with a sophisticated maneuver. He tried to limit the scope and impact of the discussions only to the literary world. To aid him, Peng Zhen called on Lu Dingyi, head of the Propaganda Department. Peng Zhen then sent Wu Han off to a rural commune to participate in the “Four Cleanups” campaign. This was, all things considered, a rather light punishment, a slap on the hand. In February, 1966, Yao Wenyuan’s criticisms were dismissed as “gossip.” At the same time, Peng Zhen was now investigating the Maoist critics in order to depose them, including searching for “incriminating materials” on Guan Feng. Peng Zhen convened a team, his “Group of Five,” to issue a final verdict and close the Cultural Revolution debate. Two dissented, including Kang Sheng. The final verdict sought to keep the struggle limited to academic circles by deflecting the political implications. The verdict was that “expert study” of Hai Rui would be made at Beida University. (28) (29) Thus the issue was to be closed and the Cultural Revolution was to be tamed just as the earlier Socialist Education Movement had been. Because of the conflicts in culture, people were already beginning to talk of a “Cultural Revolution,” although the term would not become widespread until April, 1966. Already at the beginning of 1966, there was a mostly revisionist “Group of Five in Charge of the Cultural Revolution” that included Peng Zhen, Lu Dingyi, Chao Yang, Wu Lengxi, and Kang Sheng. Only Kang Sheng could be considered a Mao loyalist. All of the others were associated with Peng Zhen, the rightists and revisionists. The “Group of Five” was dominated by critics of the Maoist line; it was dominated by those who politically aligned closely with the top revisionist, President Liu Shaoqi. A question arises: Why was Peng Zhen and his team put in charge of the campaign to revolutionize the superstructure, to revolutionize and debate culture? Many speculate that Mao put Peng Zhen in charge knowing that he would make errors that would lead to his downfall, which is exactly what happened. Another, more probable explanation, is that the revisionists were the ones who already controlled the cultural establishment. Mao’s influence in the Party was simply limited. So, it makes sense that the a Party hierarchy dominated by President Liu Shaoqi and Deng Xiaoping would maneuver their own people to run the campaign, thus thwarting any Maoist effort, which is what initially happened. In February, 1966, Peng Zhen issued a “Outline Report on the Current Academic Discussion Made by the Group of Five in Charge of the Cultural Revolution” or “February Outline.” This document was to serve as the official guide for debates ranging on a number of cultural works at the time, but was meant to be a kind of guide to the Cultural Revolution generally. Once again, it stressed the academic nature of the debates. The “February Outline” claimed “that no link existed between Wu Han and Peng Dehuai.” (30) (31) The report also warned against “arrogance” and condemned “scholar tyrants who are always acting arbitrarily and trying to overwhelm people with their power.” This was a transparent allusion to Yao Wenyuan and other Maoist critics. The “February Outline” sought to take control of the debate, recommending that “criticism and repudiation by name-calling in the press should be conducted with caution and with the approval of the leading bodies concerned.” (32) Although the report adopted Maoist verbage, it directed debates away from Maoist conclusions. The report was popular among the Party establishment and hierarchy. The press echoed the report’s conclusions. For now, Peng Zhen and the revisionists appeared to win. The writings of Peng Zhen’s allies were said to be the “most vicious attacks on the Party, socialism, and Mao Zedong Thought” and they were “poisonous fog and blinding dust.” (42) The second-tier figures of Wu Han, Deng Tuo, and Liao Mosha were openly being portrayed as the revisionist “black line” in the media. Shanghai Liberation Daily published “Open fire on the anti-party, anti-socialist black line” by the pseudonym Gao Ju. Guan Feng published a similar attack in Guangming Daily. In the three month period from the beginning of the year through march only 90 articles appeared attacking Wu Han, in April 4,000 appeared criticizing Wu Han and his associates. (43) The tide shifted in favor of the Maoists. The principal first called our attention to the numerous accounts of the criticisms of The Three-Family Village. 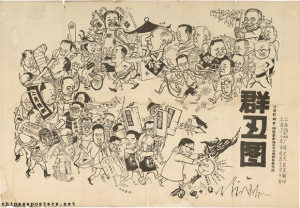 He accused Wu, Deng, and Liao of using their positions to attack the Party and of seeking the restoration of capitalism. He cited the high tide of criticism to show that conditions were excellent for a counterattack against the bourgeois line and emphasized our responsibility to unite, criticize, and defend the Party and the nation. From Mao’s statement, a slogan was born: “You must overturn the King of Hell and set all the little devils free!” This slogan meant that the top leaders should be criticized by the lower cadres. (48) Mao sought to unleash a wave of criticism of the Party and cultural elite from below. The Propaganda Department had opposed Maoist pushes since the Great Leap. They had allied with President Liu Shaoqi and Vice-chairman Deng Xiaoping. Revisionist control of the Propaganda Department had prevented the Maoists ability to go through normal Party channels. It was Lin Biao’s military, an emerging New Power, not the Party, that was the main vehicle for Mao Zedong Thought. While the Party’s official channels had been undermining Mao Zedong Thought, Lin Biao was promoting it through the army’s General Political Department, media, and culture work. As Lu Dingyi opposed the spread of the cult of personality around Mao, the General Political Department promoted the cult as a pole of authority. (49) Lu Dingyi was now accused of opposition to Mao Zedong Thought and the Cultural Revolution. Peng Zhen’s lower-ranking allies began to fall. The storm was not over. It had only just begun.